If your car has a few years on it (like mine) chances are that it is near impossible for you to have a conversation at normal speaking volume while driving down a gravelly road or rumbling along the motorway. 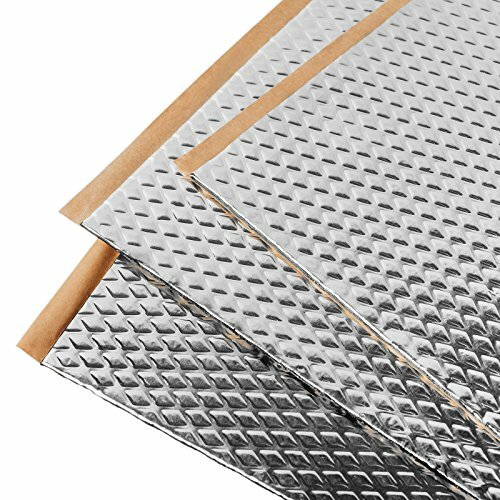 Lay sound deadening foam mats under your floor mats. Insulate your car doors and car boot. Change your tyres to tyres which have a smaller surface area. Driving creates a lot of vibrations which, unless your car is well cushioned, oiled and insulated, will find their way into your car and make a lot of noise! If you want to be able to enjoy your music, hear your radio or have a conversation in your car without having to shout then there are a few steps you can take to make your car more soundproof. This is done by deadening the vibrations which will reduce the volume of road noise inside your vehicle. The floor of your car has a very large surface area and is in closest proximity to your vehicle’s wheels and axles. This means that vibrations travel straight into it and can often be amplified by the floor creating a lot of noise inside your car! 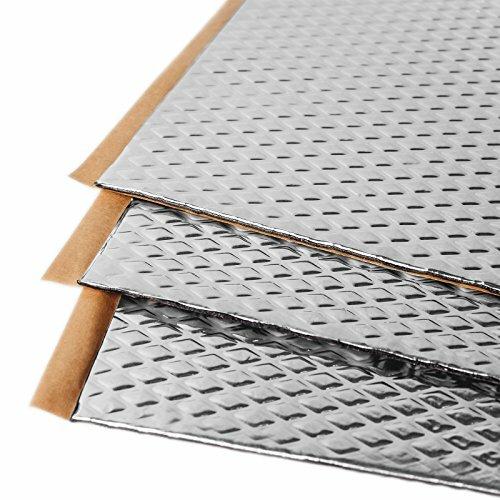 The best way to minimize vibrations travelling through your car floor is to lay down a sound deadening mat (AKA a foam shield). This will absorb vibrations from your floor and significantly reduce road noise. Cut to fit your car (use your existing floor mats as a template to cut around). Stick and press the Dynamat into place. Replace your original floor mats on top. A word of warning though, Dynamat is very sticky so try and avoid getting it stuck to yourself as it can be painful and frustrating removing it! 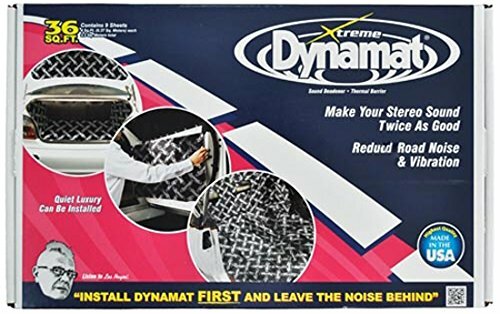 Regardless of which sound deadening foam you use the effectiveness of it will largely depend on how thoroughly you cover your vehicle’s floor. Many people just cover the passenger and driver footwells however to get the most of your mats you should also cover the rear footwells and the boot of your car if possible too. If you are soundproofing a van then you should also cover the cargo space too, especially if it is an open cargo space rather than a cargo space which is separate from the cabin. The large flat cargo area in most vans acts similar to a big drum allowing vibrations to be amplified. If your cabin and cargo space are separate then the sound reduction will be much less significant however it will help stop vibrations reverberating from the cargo area into the cabin so is still worth doing. A lot of cars have very thin doors with minimal insulation (just an empty cavity inside) so insulating your doors can have a big impact on the volume of road noise inside your vehicle. To insulate your doors first of all your need to remove the inside panels. To do this you will need to locate and unscrew all screws on the interior of your vehicle doors. This will expose the inside of your door and will allow you to measure how much insulation will be required. Choose insulation which has a peelable sticky back such as Noico which you can simply peel and stick to the door. This will make the job much easier than having to manually stick insulation down as this will usually require removing the entire door. Ensure that you cover as much of the door as possible with insulation while taking care to avoid obstructing any moving parts such as the lock or window mechanisms. Then screw you door panels back on and you’re done…with soundproofing the doors! Your car tyres have an enormous impact on road noise in your car. Your wheels are the only part of your vehicle in contact with the road, every single vibration which finds it way into your vehicle while driving has to travel through them. Changing your tyres can therefore have a significant impact on road noise. When looking for tyres which will help soundproof your car and reduce road noise there are a few key things to take into consideration. Low profile tyres are the worst type of tyre for road noise, the best tyres are tyres which maximise the amount of rubber between your car and the metal wheel. Unfortunately fashion has dictated that a large wheel with a very slim profile tyre is the most attractive wheel style these days. This means that particularly in newer cars there is often minimal rubber on the wheel to absorb and cushion your car against road vibrations. You should review your car manual to find out what the maximum tyre size you can fit on your car is and go for that option. Tyre width is also important in reducing road noise, a broad wide tyre has much more surface area in contact with the road, this means that more of your wheel is in contact with the road this providing the opportunity for more vibrations to pass through your wheel. Having narrow wheels will reduce the amount of contact your cat has with the road and therefore reduce road vibrations. Again check in your car manual to find out what the thinnest wheel & tyre you can fit on your car is. Tyres are built differently depending on what the intended use of them is. Tyres which are designed to carry heavy loads are much harder and will therefore transfer much more road noise, tyres which are designed to be driven at high speeds are also much more solid than tyres designed to be used at lower speeds. Many road users often use tyres which are designed for vehicles far heavier or faster than their vehicle, this leads to an unnecessarily noisy ride. To work out which is the right tyre for your you first need to understand tyre descriptions. These are printed on the rim of every tyre and, if you know how to read it, it give you all the information you need to know about whether the tyre will fit your car and if it will help reduce road noise. The first number, 215, indicates the width of your tyre in millimeters. Narrower tyres are beter for road noise reduction. 60 = the profile height of your tyre is 60% of the tyres width. The second number, 60, refers to the aspect ratio – for example an number of 60 indicates that the profile height of the tyre is 60% of the tyres total width. The higher this number the thicker the rubber that is in contact with the ground. A high aspect ratio is a good thing when you are looking to reduce road noise. The letter indicates how the tyre was constructed. R means is is a Radial tyre which is made with cord plies. The vast majority of modern tyres are made using radial construction methods so it is very unusual to see any other letter in your tyre description. This doesn’t have any real impact on road noise but it’s worth knowing! 15 = the tyre is designed for a 15 inch wheel rim. 90 = your tyre can handle 600kg of weight. The next number is the load index number. This tells you how much weight the tyre can take. Your car manual which tell an appropriate load index number to use. It is advisable not to use tyres below that number…also don’t use tyres which are significantly above that number too as they will be very stiff and will therefore increase road noise. T = The tyre can maintain a maximum speed of 118mph. The speed rating scale goes from Q to Y. Q rated tyres can maintain a maximum speed of 99mph and Y rated tyres can maintain a speed of 186mph! You should check your handbook to ensure that you have the minimum speed rating required as some insurers will not payout on claims if you are using tyres with speed ratings that are too low. However don’t be tempted to get the highest speed rating you can afford as tyres with high speed ratings are incredibly stiff and therefore transmit a lot more road noise than a lower rated tyre would. The decibel rating is a measure of how many decibels they recorded in their tests as the car rolled past. The test involves driving a car at 50mph past a microphone with the engine turned off, meaning the only sounds picked up come from the rolling of the tyres. With the wave rating system one black line means excellent performance and three black waves indicates very poor performance. Obviously for road noise reduction you want as few decibels as possible and a one line rating. Get tyres which has an appropriate speed rating. If you never drive faster than 70mph you don’t need tyres which can do 180mph. Get tyres which have an appropriate load index number. If you’re not driving a giant wagon then you can get away with a relatively low Load index number that will give a much quieter ride. Look for a tyre with a high aspect ratio number. Check the tyre noise rating. My name is Dan and I live very close to an internationally famous stadium which generates an awful lot of noise that I'd rather block out! This site is my place to share what I've been learning on my soundproofing journey. Soundproofpanda.com is a participant in the Amazon Services LLC Associates Program, an affiliate advertising program which is designed to create a way for website to earn advertising fees by advertising and linking to Amazon.com, Amazon.co.uk and other versions of Amazon. ​We may also earn small fees from other affiliate programs.